The Anson County Chamber of Commerce 2017 Christmas Parade will take place on Saturday, December 2nd, at 2:00 PM. The Chamber is NOW seeking participants in the following categories: Marching Bands, Homemade Floats, Antique Cars, Walking Groups & Floats. As always, Santa Claus will make his first appearance in the Christmas Parade. The parade route will begin on Morven Road and travel down to turn left on Morgan Street. The next right will be at Washington Street, left on Martin Street then an immediate left on Greene Street. The parade will continue on Greene Street and disband at the Ray Shelton Ball Field parking lot. 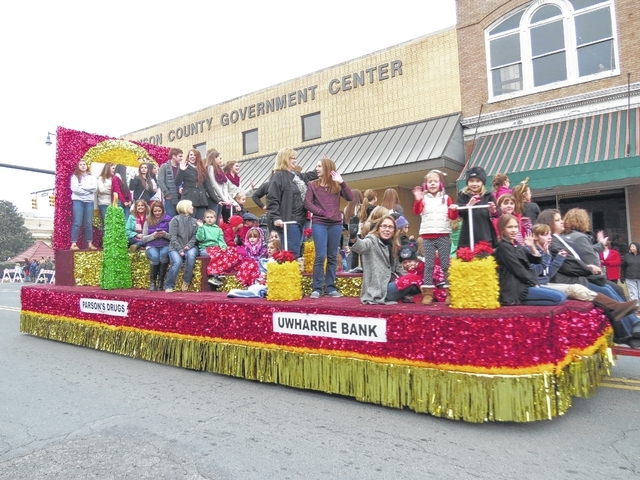 To participate in this year’s parade, pick up an application at the Chamber of Commerce located at 107 A East Wade Street, in uptown Wadesboro. Or to request an application via email, please email requests to info@ansoncountychamber.org. Enter parade lineup from Hwy 52 South and unload at Ray Shelton Ball Field. Absolutely NO traffic on Ashe St.
No sirens or extremely loud horns! Participants must sit if a handheld stand is not available on float! Participants are not allowed to sit on edge of float, tailgates or sides of trucks! Please stay at least 30ft from the vehicle in front of you! Vehicles operators shall not perform any special maneuvers or race along parade route!